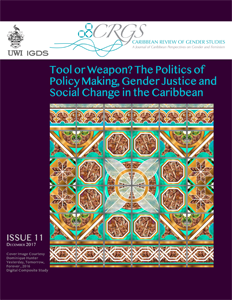 Between April and July 2016, The WomenSpeak Project conducted a study on how women and gender focussed civil society organisations (CSOs) in the Caribbean are using social media and other digital technologies to improve the outcomes of their work and to influence the policy space. Twenty-six CSOs participated in a survey which sought to highlight the various strategies they used to connect with their virtual constituencies and their successes in using social media to advance their work. 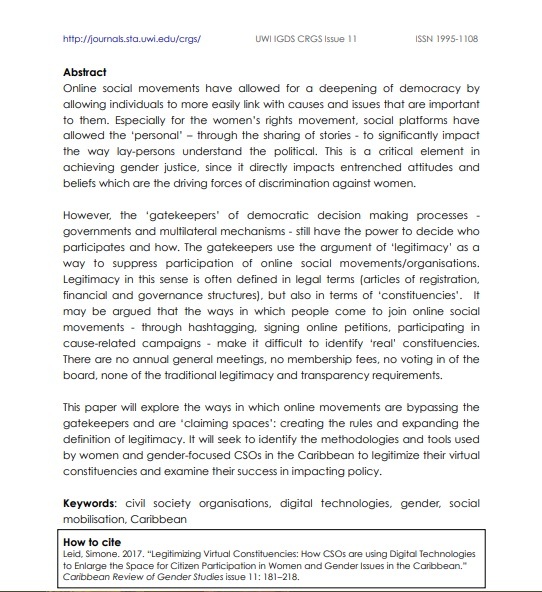 This study forms the basis of the paper “Legitimizing Virtual Constituencies: How CSOs are Using Digital Technologies to Enlarge the Space for Citizen Participation in Women and Gender Issues in the Caribbean” which has been published in the Caribbean Review of Gender Studies Issue 11 edited by Deborah McFee and Michelle V. Rowley. The paper also includes a proposed “Protocol for Legitimizing Virtual Constituencies” which seeks to help CSOs have more meaningful engagement with their virtual constituencies and thereby enlarge and empower their support base. This is an important part of movement building and organising in the age of social media, and has the potential to create significant shifts in the power balance between civil society and the state. It is hoped that this paper will not only serve as a document of Caribbean women and gender organising but will be a tool for further discussion and building knowledge around strategies that can be used to advance important issues in the public policy space.